Khoa Lak is Thailand's stunning area of coastline and has become a premiere destination for anyone looking for a relaxing beach getaway. Located in the Phang Nga province, Khoa Lak has something for everyone. From bustling tourist destinations to quiet, secluded beaches, you'll find unique experiences, one-of-a-kind dining, and natural beauty along forty kilometres of coastline. If you're looking for a smaller beach with stunning sunset views and calm waters for swimming or snorkeling, Bang Niang beach is the perfect holiday destination. Although this beach is less developed than others in Khoa Lak, it is one that is quickly growing and offers many hotels, souvenir shops, and dining options. You can also stop by a massage parlor, optician, or the tsunami museum, and there's a unique marketplace open on Mondays, Wednesdays, and Saturdays. This is also a longer beach and has plenty of trees, so it is perfect for a quiet stroll in the shade. This is another quieter destination that still offers plenty to do and see. It's well known for its selection of five-star hotels and surfing during the low season, which runs from June to November. Be sure to check out Krua Rim Tang, a popular Thai restaurant on the road to the cape. There are also high-quality restaurants to the north and south, and the cape juts into the sea so you'll have a view of the surrounding beaches. You'll find this five-kilometer long beach nestled between Bang Niang and Pakarang Cape. Khuk Khak has few resorts, so if you're looking for a secluded beach with multiple fine dining options and plenty of beach for a stroll, make sure to put this one on your itinerary. This beach is famous for its Memories Beach Bar and surfing during low season. Also be sure to visit the daily food market. Khao Lak is one of the area's shortest beaches tucked away under the mountains, removed from the traffic of some of Khoa Lak's other beaches. There is a handful of hotels as well as two convenience stores and two bars, so this is a perfect place for anyone looking for a quieter getaway in a tropical environment. Also known as Pakweeb Beach, this is one of the least-developed beaches in Khoa Lak. This beach has national park status, so you won't find any motorboats. The locals take great pride in this beach and take a lot of care to keep it clean, so this is a great destination if you're looking for a low-key, no-frills spot. This beach is another well-kept secret. Located north of Natai beach, Thai Muang houses a golf course and a natural park, so it's a perfect destination if you're looking to take in the natural beauty of Khoa Lak. Like Natai Beach, you won't find motorboats or vendors here and Thai Muang is not a well-known tourist destination, so you can expect a tranquil experience as you stroll through the thirty kilometers of sand. Be sure to visit the Khao Lampi-Hat Thai Muang National Park at the northern edge of the beach. This tropical park has 72,000 square kilometers of hiking trails, water falls, and hot springs. Another major attraction here is the Phang Nga Coastal Fisheries Research and Development center, which houses a sea turtle sanctuary. You'll also find a number of seafood restaurants and the Sea Ranch Pizza Restaurant for a slice of western cuisine. Hotels are scarce here, although there are a couple of hotels located near the hot springs. If you plan to camp out, Thai Muang is the ideal holiday destination. This beach is the heart of tourism in Khoa Lak, so it is quite busy and has a wide variety of shops and restaurants available. It also has a vibrant nightlife scene as well as diving schools, book stores, doctors, dentists, tailors, and luxury hotels and bungalows. Nang Thong is also known for it's swimming, sunbathing, and snorkeling as well as the rocks and palm trees along the beach. Nang Thong also houses the La On Village, the main entertainment hob of the beach. If you're looking for a one-stop shop for your holiday, Nang Thong may just be it. All of the hotels along Sunset Beach are nestled on the side of the mountains surrounded by rain forest. You'll find it at the very southern end of Nang Thong beach, and while there are few restaurants located here, the beach is well within walking distance of other spots for fine dining. It is also ideally located just past the Khao Lak Lamru National Park. This beach's name speaks for itself: it boasts 2,600 meters of brilliant soft, light yellow sand and turquoise sea. There are a few luxury resorts and dining venues, but it isn't as busy as some of the other beaches in Khoa Lak. If you desire more dining and shopping, White Sand Beach is a roughly fifteen-minute drive from Khoa Lak's main urban hub. This is an ideal location for a tranquil holiday with stunning views that can't be beat. Khoa Lak boasts some of the world's most beautiful beaches and tourist attractions. You'll enjoy the many fine restaurants, beach resorts, shops, and peaceful beachfronts as you soak in the local culture. 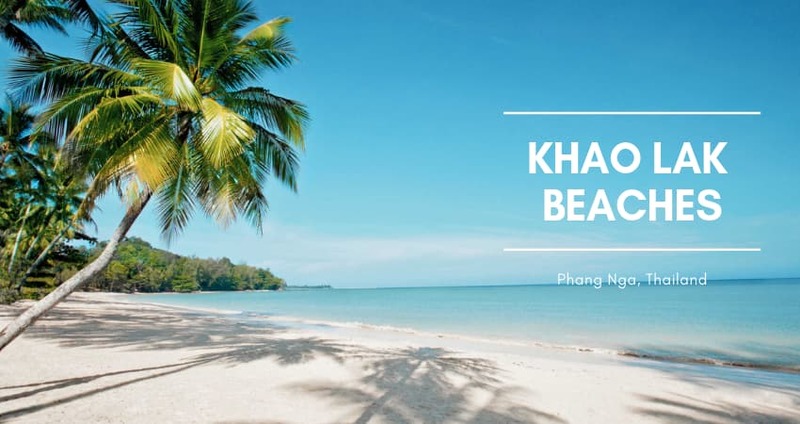 No matter what sort of holiday suits you, there's truly something for everyone at Khoa Lak, so pack your bags and book your trip today! Natai Beach is one of Phang Nga's best beaches and its best kept secret. Very few people know about it, most likely owing to the building regulations that govern it. It doesn't have the frills of other beaches, and building laws prohibit the construction of large hotels, making Natai Beach is a perfect spot for a quiet stroll on the beach. There are a few beachfront restaurants serving Western and Thai dishes.